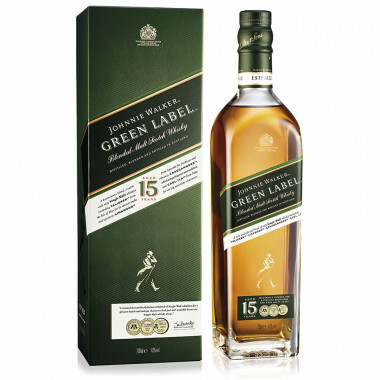 Green Label comes from the Johnnie Walker brand and is the result of the blend of 12 scottish Single Malts such as Caol Ila, Linkwood, Cragganmore and Talisker. Johnnie Walker is the largest whisky producer in the world with the most bottles sold worldwide each year. The brand is a must in the world of spirits with its unique graphic code of square bottles with their diagonally labels. Green Label is a 15 year old blend and is the result of a mix between 12 scottish Single Malts. Green Label has a unique spicy and smoky taste. It is a mixture of the best areas of Scotland, Speyside, Islay and Isle of Skye. A characteristic Malt from Speyside that gives Green Label fragrances of flowers and fruit, with a cedar finish. The origin of the exceptional malty taste and subtle notes of smoked wood and sandalwood, Cragganmore is a sweet and fragrant Speyside whisky. This unique, well-kept secret malt from Islay Island brings rich fruit notes, iodized notes and smoky peat. Smoked wood, pepper, oak and fruit echo in this malt from the only distillery of the Isle of Skye. The brand Johnnie Walker, known under the name Walker's Kilmarnock Whisky, was created when John "Johnnie" Walker started selling whisky in his grocery of Ayrshire in Scotland. It started growing after his creator's death in 1857, thanks to his son Alexander Walker and his grand-son Alexander Walker the second. The square bottles with side labels, specific to Johnnie Walker brand were introduced in 1870. The shape of a man walking big steps where in 1908 influenced by James Stevenson at the same time as the slogan "Born 1820 - Still going Strong!". Known worldwide, this blended scotch appears pretty often on cinema, TV shows and music videos. Nose: smoky malt and nutmeg, with honey in the background. Palate: strong peat presence surrounded by fruity notes. Finish: it finishes on floral and herbal notes.